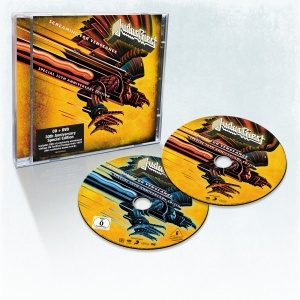 “Screaming For Vengeance” was released to celebrate the 30th anniversary of Judas Priest’s eighth album – their first album to go double platinum. It includes the massive radio anthem “You’ve Got Another Thing Coming.” This is when Judas Priest started to sound more commercial and less like the genre of heavy metal that they basically helped invent. There are also six live tracks from “Screaming For Vengeance” included after the studio portion. The DVD contains Judas Priest’s concert from the 1983 US Festival in San Bernardino, California. They are in prime form with this concert. The duel guitars are on fire with K.K. Downing and Glenn Tipton. The setlist includes their three biggest radio hits “Breaking The Law,” “Living After Midnight” and “You’ve Got Another Thing Coming.” The audio is phenomenal, while the picture sometimes looks like it was shot in the early 80s with flickering and color contrast changing. Relive the classic time period for Judas Priest. This was the same period that they broke out as main stream in America with a massive following. The ability to see them on that faithful day at the US Festival is an eye-opening experience. They were really at the top of their game back in that time frame.